The good news at present is that background levels here have stabilized. We still occasionally get significant peaks, but these events are not now as common as in 2011, 2012, and 2013. For four years before Fukushima a GammaScout Geiger counter logged once a week local background radiation levels. The averaged over that time was ~ 0.1 uSv/hour. This data has allowed a comparison of background levels before, and after Fukushima. The peak in the pre-Fukushima background level chart around September 2008, was probably an experiment being carried out at the time. Since 2012 local background radiation level data has been logged every 60 seconds. The four years before Fukushima recorded data doesn’t show much seasonal variation in background levels. After Fukushima, a seasonal variation showed up in the year average charts. Northerly winds tend to come from the equator here in the warmer months. In the cooler months, it tends to come from the Southern Ocean. The station location is on a headland, so there can be significant changes in background levels as the wind changes from North to South. After you average out the season differences here, the yearly increase since Fukushima has averaged around 21%. The 2012 year average was 21% above the pre-Fukushima 4 year average. The 2013 year average was 22% above the pre-Fukushima 4 year average. The 2014 year average was 20% above the pre-Fukushima 4 year average. They show significant waves of radiation coming through. When wind came from a Northerly direction, background went up. When wind direction came from the Southern Ocean, background tended to go down. Now the increases showing on the 24 hour charts are much more averaged, and no where near as dynamic. This suggests that what ever was in the air in 2011, 2012, and 2013 that crossed the equatorial barrier, has had time become more evenly distributed into the southern hemisphere air mass. make it a lot easier to see accurately, what is happening worldwide. As radiation fallout does not fall evenly, there will be areas that have seen significant background increases, and other areas that have only seen small increases. 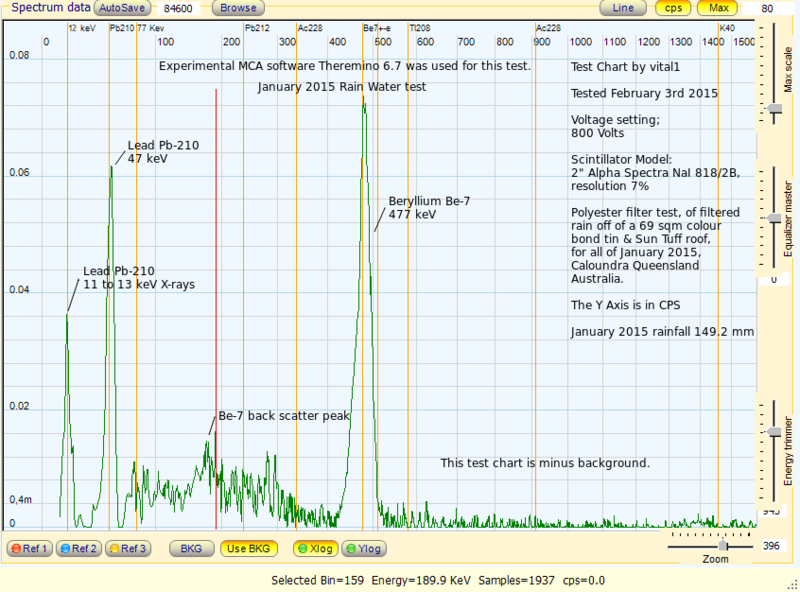 Southern Hemisphere January 2015 Background Radiation Report. There as been a small decrease in January background. This is good and means that background levels are not increasing at present, and have stabilized. 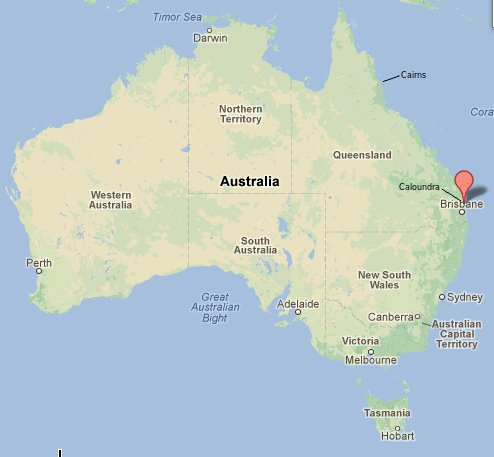 At least at this location in the Southern Hemisphere. January 2015 monthly average background radiation level was 40% above the pre-Fukushima average. January average for 2014 was 41% above the pre-Fukushima average. January average for 2013 was 52% above the pre-Fukushima average. January average for 2012 was 43% above the pre-Fukushima average. On the 26th January 2015 it was 80% above pre-Fukushima average levels. This put the monitoring station into it’s second alert level. It was a hot, humid, fine day. 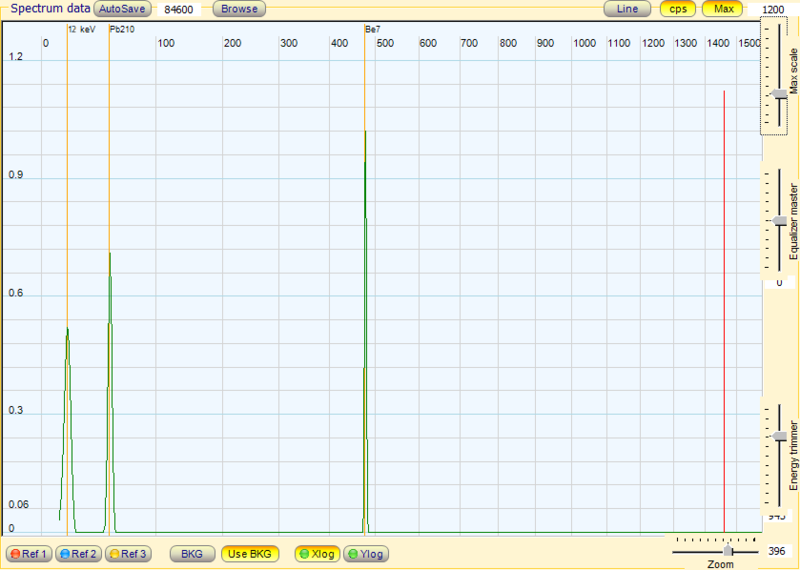 As you can see there was more Beryllium Be-7 detected than Lead Pb-210 this month. January rainfall was 149.2 mm. Beryllium Be-7 can be made by spallation in the upper atmosphere, during solar events, and takes around two weeks to reach the surface. Lead Pb-210 is a decay daughter of Radon Rn-222. Both these isotopes can also be released from a Nuclear accident. My view is that because of the upper atmosphere damage caused by the Fukushima nuclear catastrophe, and a weaker magnetosphere, smaller solar events are now having a greater impact on the Earth’s upper atmosphere. This is a possible explanation for the increased Beryllium-7 detections in rain water washouts here. I have provided two test charts, one is the normal minus background. The other uses a new SuperDeconvoluzione feature in Theremino 6.7 that provides results that are very similar to those obtained with the expensive high purity Germanium detectors. In this chart I have CPS on the Y axis to show activity, and have turned off Y log to show linear scaling. This is only a test chart of the polyester part of the rain water filter system design.